Keeping your makeup organized is a great start to having clean and bacteria free products because you know where it all is. Today I'm going to tell you everything you need to know about how to care for and clean your makeup, plus how long you can expect it to last. 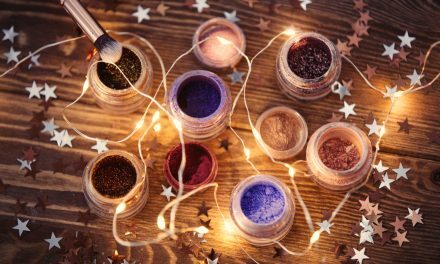 All good makeup applications start with healthy skin so the proper care of your products and beauty tools is as critical as your skincare routine. Don't miss Makeup Organizing Ideas: Tips & Tricks With American Made Products. 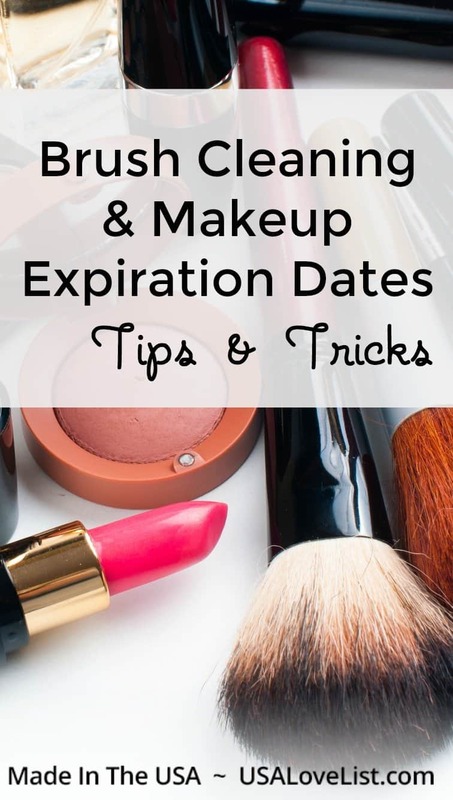 Yes, makeup does expire! 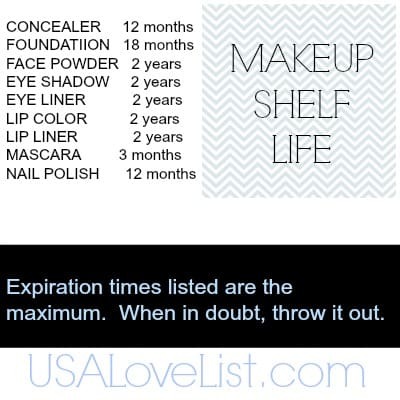 This chart will give you a basic guide for how long of a shelf life your makeup has once it has been opened. 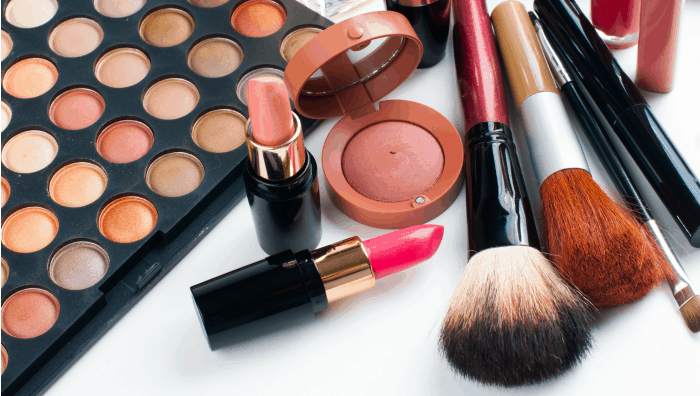 Following this shelf life guideline keeps your makeup bacteria free. Since beauty products don't have expiration dates on the bottle or case, always remember- When in doubt, throw it out! Need to stock up on new makeup? 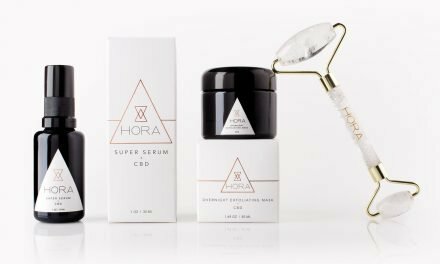 Don't miss our source list of American made beauty brands. Keeping your brushes clean prevents dirt, oil and makeup buildup. That keeps your application smooth and wards off unwanted shine. Brushes should be cleaned bi-weekly at a minimum. For oily and break out prone skin types, weekly is ideal. Don't forget your makeup bag either. It is a complete breeding ground for bacteria. Ew! Use a brush cleanser. 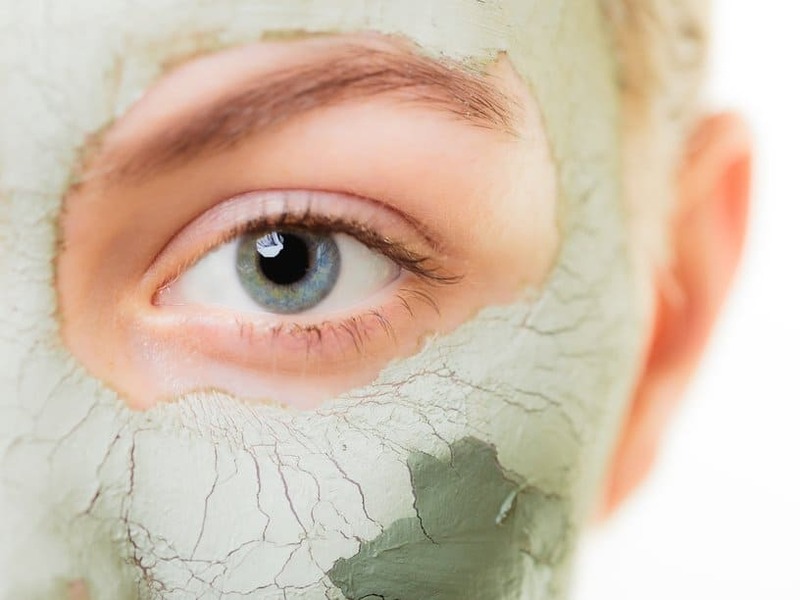 Put a dime size of cleanser with a little water in the palm of your hand and swirl it around to loosen up all the makeup, dirt and oil buildup. Continue you to swirl and rinse under warm running water. Reshape brush and let air dry. Mine dry really fast in a brush holder made of a re-purposed candle jar with stones sitting on my bathroom counter. Use a quality sponge. The Beauty Blender is a makeup application sponge that helps achieve great coverage with minimal makeup and leaves a flawless finish. Many products of this kind are not made domestically, but the Beauty Blender is made in the USA. The Beauty Blender is a latex-free sponge as well. The Beauty Blender Cleanser is dye free and irritant free with a light lavender sense. It is in a moisturizing soy base as an added bonus. Keeping your brushes and sponges clean prevents dirt, oil and makeup buildup. That keeps your application smooth and wards off unwanted shine. Thanks for the list. I didn’t realize that nailpolish only lasts about a year… time to do some cleaning out! Awesome tips and always good to keep this in mind! wow, I had no idea mascara is only good for 3 months??? I better get rid of mine today.